Propane expands when heated. That increases the pressure in the tank. Above a certain pressure, the relief valve opens to release a small amount of vapor. That release keeps the pressure from building up too much inside the tank. Once excess pressure has been released, the relief valve closes automatically. Its important to keep your tank painted with a white, aluminum or other reflective color. A rusty, unpainted or dark-colored tank may cause pressure build-up resulting in a safety relief valve discharge. 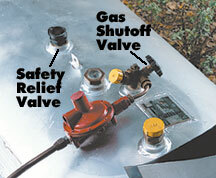 Call your propane marketer whenever your relief valve pops off, so they can determine the cause.